We opened the door to the front porch and there it was standing on the railing. There was a dead squirrel close by. He was not at all frightened and there were three of us just inside the door. After a while we waved him off and threw the dead squirrel farther from the house but where he could easily see it. 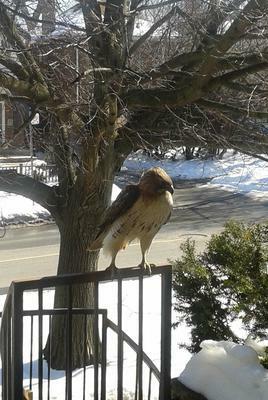 He came down from the roof and grabbed the squirrel then he flew up Avenue Road (Toronto). It was a real treat to see him.